chilling prognosis for our future. The term ‘runaway greenhouse effect’ was coined by researchers at Caltech in a paper on the atmosphere of Venus. Regardless of what the authors might actually have known about Venus, the way this term has been used in papers available on the Internet constitutes deliberate deception. When global warming alarmists point to the atmosphere of Venus as an example of what will happen to Earth if we continue to burn ‘fossil fuels’ and exceed their tipping point, it only demonstrates how delusional they are. The ground temperature of Venus is almost 500o C, (close to 900o F) and lead (melting point 327.5o C) and zinc (melting point 419.5o C) would both melt readily on its surface. This comparison to Earth can still be found in some articles promoting the concept of anthropogenic climate change, as alarmists use any reason that occurs to them to promote their claims. Carbon isotope analyses of rocks in a quarry in southern China have led to the implausible claim that CO2 levels in the atmosphere at the time of the great Permian extinction event were comparable to those of our present climate. Furthermore, the rate of addition of CO2 to the atmosphere then is claimed to have been even less than it is today. Since well over 90% of all species are thought to have died out during this event, when most volcanoes on Earth were erupting, it’s clear to see that the alarmists have recognized yet another smoking gun. One factor supporting their concerns could be so many smoking guns. When CO2 readings on Mauna Loa first exceeded 400 ppm, ‘The New Yorker’ advised that “The fate of the earth hangs in the balance.” That is journalistic nonsense, as the CO2 content would have been at least several times more in the past during catastrophes. Are we having any effect on the climate at present? Certainly we are by our generation of heat-trapping gasses, but that will be barely noticeable compared to predictable future effects resulting from natural processes. 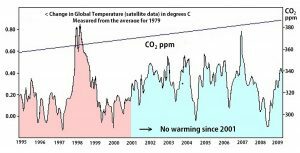 Present climate changes have been accompanied by a significant percentage increase in carbon dioxide, but any direct causative conclusions can only be arrived at by ignoring times when observations failed to support similar claims. I expect atmospheric CO2 would have reached a peak at the Permian-Triassic boundary, which is now dated at just over 252 million years ago. With so much volcanic eruption, that’s what you get. Equating our own addition of CO2 to the atmosphere with conditions that prevailed at the end of the Permian, is an example of the alarmists developing a cult all their own. Regardless, we are faced with more immediate concerns. Most climate alarmists fall into two camps. The majority consists of sincere people who recognize that something is definitely wrong with our world but they are unsure of what should be done about it. They have been manipulated into believing we can save the planet only if we abandon the use of ‘fossil fuels’. Another camp comprises a small group that salivates at the prospect of becoming obscenely rich if only they can sucker all the rest of us into buying into their absurd carbon credit schemes. Now that alarmists have replaced ‘global warming’ with ‘climate change’ they figure they have all their bases covered. In this way, they anticipate maintaining their influence regardless of what the climate does, as long as it changes, which it can always be relied upon to do. Use of the term ‘climate change’ can also be used to avoid the inconvenience of global patterns refusing to support their concerns, since conditions more agreeable to their concerns can usually be found in selected regions. When a team led by Fridtjof Nansen made the first known crossing of the Greenland ice cap in the summer of 1888 they were surprised at what they encountered on top: mild temperatures, small rivers, and roaring waterfalls descending into seemingly bottomless holes; in fact, the very phenomena that are used today to convince us the ice cap is disappearing due to our burning fossil fuels. The volume of ice doesn’t remain constant, but increases or decreases over lengthy periods. 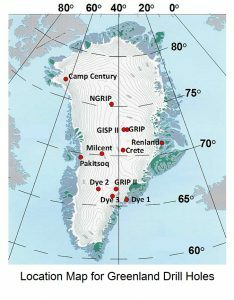 Six P-38 fighter aircraft and two B-17 bombers that crash-landed on the Greenland ice cap in 1942 after their refueling base and home base were both closed in by weather are now covered by more than 75 meters (250 ft.) of ice, demonstrating that the ice cap is continuing to build up, at the rate of a meter per year. At this rate, the entire ice cap could form in only 3,000 years. The ice cap is reaching a new equilibrium with present conditions and there is no indication that it will disappear, even though ice is presently being reduced around the edges. Remember that a thousand years ago Vikings farmed along the coast of Greenland. Several warm/cool cycles have been recognized on different scales, over periods from 1,500 years to more than 100,000 years. When the Vikings were farming on Greenland it wasn’t a result of industrialization, and when crops failed from a frigid climate in medieval times it wasn’t because Europeans had a carbon tax. 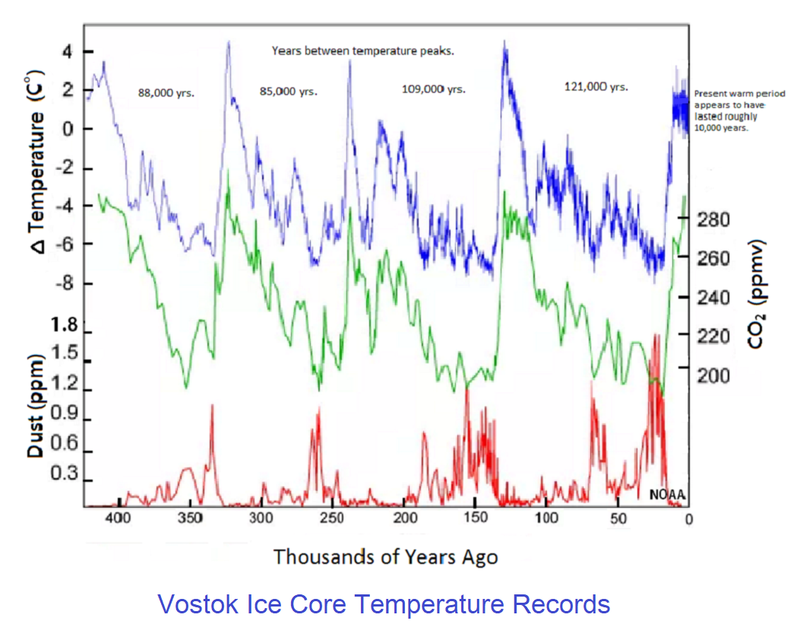 Ice core records from Polar Regions show that atmospheric temperature peaks have preceded CO2 peaks by hundreds of years, due to the influence of the oceans. As the oceans become warmer they absorb CO2 and as they become cooler CO2 is released back into the atmosphere. The relationship between CO2 and temperature increases has been affected by modern industrialization, but adverse consequences are insignificant compared to what the Sun could have in store for us, perhaps sooner than we could have ever imagined (See: ‘The Doomsday Graph’ below.) Even if there should be an exact coincidence between CO2 measurements on Mauna Loa with reduction of the Arctic ice-pack, as is presently claimed, it won’t require much of a change in solar energy to alter such a relationship. Modern industrialization is adding CO2 and other gasses to the atmosphere, and probably contributing to temperature increases from the ‘greenhouse effect’. But the extent of this has become an obsession with the alarmists, and in the long run, it will be unimportant. Given future challenges that are certain to develop, we are directing attention to the wrong problem. To a significant extent, obsessing over climate change is really a substitute for addressing other problems that we may feel inadequate to do anything about. An analysis of the future of humankind concerns me deeply. I believe we are destroying the biosphere of our wonderful planet by the inexorable demands of human overpopulation, pollution, and destruction of habitat for our fellow space travelers. I suspect that our very existence could depend, in yet unknown ways, on some of these fellow travelers. We have identified climate change as the greatest concern of our times only because that is easier than trying to fix the real problems we face. Sooner or later, all climates do one thing: they change, as they have been doing for millions of years, and there is almost nothing we can do about that. As sunspot activity continues to diminish, a much cooler climate might be coming sooner than we think. An early indication could be a reversal of the recent warming trend in the Arctic, where instead of cruise ships sailing the Northwest Passage without hindrance, even icebreakers will be prevented entry by conditions similar to those encountered by the Franklin expedition in 1846 to 1848. Since then, there have been several relatively minor climatic changes, and in future, there will be many more. There is unsettling evidence, however, that our future is going to become much colder than anything we have known in the past. Polar Bears will be frozen out of the Arctic then, as seals can maintain breathing holes only through a thin cover of sea ice, and not through an ice cap. Even measuring actual changes in the overall temperature of our planet is challenging, with the smallest reported increase being celebrated by alarmists. They freely employ, as a pejorative, the term “climate change denier” against those of us who have always recognized that climates change. It does seem strange that our total emphasis is on reducing CO2 emissions, based on our faith that we can reduce the temperature of the planet by doing so. But if we are so confident about what is going to happen in the future, why are we investing almost nothing in developing resilience into the system by hardening infrastructure? Building dikes to protect low-lying cities would appear to be a logical application of the income from any introduced carbon taxes. It isn’t that the climate won’t change, it’s just that we are not responsible for most of it even as we cause more serious problems on our planet that few are prepared to recognize. Global temperature reports in 2016 showed that increases over 2015 varied from 0.010 C (British Meteorological Office) to 0.040 C (NASA). The director of NASA’s ‘Goddard Institute of Space Studies’, commenting on these increases, stated: “We are now no longer only looking at something that only scientists can see, but is apparent to people in our daily lives.” Really? Weather is apparent to us in our daily lives, but an increase of 0.010 or 0.040 C (0.070 F), not so much. Understand that what we are talking about here is in hundredths of a degree. And if there had been a reduction of similar magnitude, would it have even been mentioned? Not much weather happens these days that hasn’t happened in the past, despite news media competing for whatever can be turned into the next big story. Increased population together with instant communications and an inflated sense of entitlement explain at least part of our perception of worsening conditions, and agencies like NASA’s Goddard Institute should be rebuked for contributing to the confusion. An illuminating book on climate change is ‘False Alarm’ by Paul MacRae, published by Spring Bay Press in Victoria, B.C., Canada. It offers a balance to those who spout nonsense on the basis of computer models. The maxim ‘GIGO’, well known to programmers, stands for ‘garbage in – garbage out’, and has been especially applicable to climate change predictions. Long-term climate changes do occur and can result in significant problems for many species, even leading to extinction for some. Problems that we can do something about, however, are more deserving of our attention. Combatting ‘climate change’ has turned into a substitute for doing anything useful that would help our planet. A feedback mechanism influencing the strength and course of the jet stream in the northern hemisphere is being studied by climatologists. A weakened jet stream can affect local weather by stalling air masses that move along it. Increasingly, erratic weather patterns are likely to be the norm, but extrapolating any specific situation into the distant future is difficult to justify. Present weather always affects us to some extent, but it is the long-term trends that will shape our way of life. Some ambiguities apply to the interpretation of ice cores, whether it is missing or additional strata, disturbed strata (from movement), or even recognition of strata. There are also major effects not yet recognized by scientists resulting from axis change. Scientists have frequently been surprised when an ice core study revealed a sudden major temperature change. This will no longer be a mystery when they recognize that a location has experienced a sudden change in latitude as a result of axis change. A loss of ice at the surface will result in deeper ice being logged as younger than its actual age. I suspect this is the reason for a prominent offset of the temperature graph of cores from Devon Island in the Canadian Eastern Arctic. The most recent axis change is accurately reflected in the determined age of about 10,500 years. The previous significant change, however, which should be at 74,000 yrs. (remember that animal remains from that flood have been dated at 75,000 years by a different method), is represented as younger by thousands of years. This suggests ice is missing from the section. 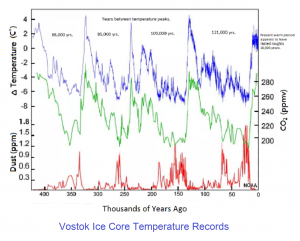 Few examples exist from tens of thousands of years ago in which confirmation of an ice core date is available from another source, so missing ice layers might not be uncommon. Consider that an oceanic flood from an axis change could almost instantly remove ice that had formed over the previous several thousand years, without the effect being recognized in an ice core. Ice eroded from the surface of an ice cap might be common at an axis change. Other changes could result from surface melting, glacial surges, and less deposition due to reduced precipitation. The age of a level in an ice core is determined by the straight-forward process of counting the number of layers from the top, each of which is accepted as representing a separate year, and there is no way of determining if there should be more layers. More layers might not have been deposited, or more likely, have been removed. Many ice core interpretations could be affected despite the work having been carried out in a meticulous manner. Axis change can result in false interpretations of climatic changes due to latitude change, and of air density from changes in altitude above sea level. The latter is affected by oblate flattening in Polar Regions, which is, of course, where most ice cores are obtained. U.S. President Obama visited the village of Shishmaref, Alaska during his first term of office, to draw attention to the effects of climate change on a coastal area that is especially vulnerable to erosion. This village was named after a Russian sea captain during a voyage of exploration when Alaska was a Russian territory, and the area has been known to have sustained settlement for centuries. The village is situated on a long and narrow barrier island of frozen sand that has undergone so much erosion lately that its people have voted to relocate their village to the mainland. The Chukchi Sea has open water for longer periods now, and with less coastal ice, storm-waves crash directly on to the frozen sand, rapidly eroding it. The President appeared to become a convert to the concept of anthropogenic climate change, which means that he attributed recent changes at Shishmaref directly to the burning of ‘fossil fuels’. His visit may have resulted in the U.S. becoming an active participant in the Paris Agreement (L’accord de Paris). Parts of the Arctic have been unusually warm lately, for reasons not related to the burning of ‘fossil fuels’. Weather patterns are one factor and the jet stream has been directing warm air further north than usual. Local CO2 production contributes little to Arctic warming but methane bubbling up from beneath the ice, or as permafrost melts, can produce greater changes. ‘Climate change’ is always with us, but it is a loaded term with climate alarmists who only use it imbued with anthropogenic implications. The section that follows, on ‘The Doomsday Graph’, may persuade some readers to question whether we are responsible for major changes to our climate. This does not absolve us of responsibility for the desecration of our planet’s biosphere, which is totally our fault. Most thoughtful people recognize there is a problem, but the solution can seem so daunting that they settle on combatting ‘climate change’ as a substitute for doing anything more significant. When the 5,300-year-old body of ‘Oetzi’, the Iceman was discovered thawing out of a glacier in the Alps it was taken for granted that his surroundings from the time of his demise were just as they are today. But the altitude of this location, above 3,000 meters (about 10,000 feet) above sea level is much higher (as in thousands of feet higher) than when Oetzi died there. The present glacier did not even exist then. It is more likely his body became submerged in a muskeg (temperate-zone swamp), which tanned his skin to leather in acidic water under anaerobic conditions from the decay of sphagnum moss. His skin should bear chemical traces of this process but evidently this has not been looked into. As a result of climate change from the increase in altitude, as well as from Earth taking up an orbit slightly further from the Sun in 747 B.C., a glacier developed, with Oetzi’s body protected within frozen muskeg. The significant uplifting of the Alps as well as other major mountain ranges, including the Andes and the Himalayas, occurred at the first of two close approaches of Venus to Earth, some 3540 years ago (in 2018). That is also when sea level dropped six meters (20 feet) around the world as tectonic forces that had built up over millennia were suddenly released, altering the geometry of the ocean basins and mountain ranges. Look for ‘raised’ benches next time you travel in the tropics. It is easier to recognize them there because some are former coral reefs which would have been exactly at sea level at low tide. Remains of coral and shells can often be found on their surfaces. As people come to recognize features such as this it may encourage them to accept some of the significant changes that have transpired in relatively recent times. Don’t think that because something is described in ‘The Book of Exodus’, or in the ancient Chinese astronomical texts from Soochow (Suzhou), that this constitutes proof that it didn’t really happen. Modern fairy tales must not be permitted to replace historical memories. Evidence of ancient human habitation has been found throughout the Alps, often at such high elevations as to be almost inaccessible at present. This has been explained away by how these people must have been so terrified of their neighbors that they chose these difficult places in which to live. When people lived there, however, the altitude was lower and access was easier. No discussion of crocodiles in Spitzbergen or coal beds in Antarctica, in relation to climate change, can make sense if axis changes are disregarded. 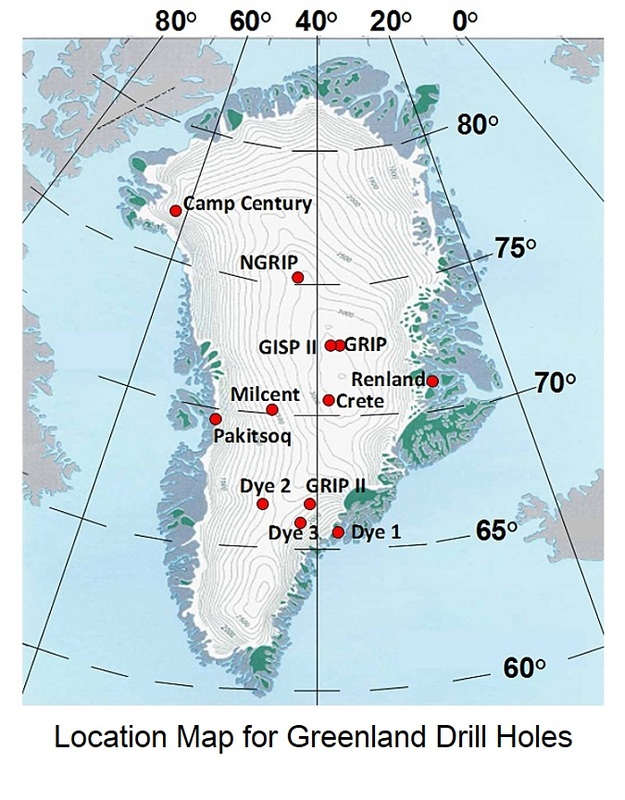 No discussion of abrupt temperature changes revealed in cores from ice caps can make sense if axis change is disregarded. And no discussion of climate change can make sense if potential influences of the Sun, or of Earth’s orientation about its axis are disregarded. Velikovsky’s sources are impressive in their diversity, and he was meticulous in their attribution. For all that, he was often challenged to find proofs of societal changes occurring thousands of years ago. Additional assistance may have become available from the new field of genetics. The October 2016 issue of ‘Nature Genetics’ provides an account of a plague that spread across Europe “about 3,400 years ago”, killing most of its inhabitants. A few did survive, due to a fortuitous group of genes which their descendants still carry today. What provided resistance then, however, has proven to be detrimental now, since these genes have been found to raise the risk of heart disease, diabetes, and hypertension. This was determined as the result of a study looking for problem genes affecting blood issues, carried out by the ‘Heart Institute’ at the University of Ottawa in Canada, with several other institutions. No known written records of the unknown disease survive today, but the genetic record indicates it could have been on a scale comparable to the ‘Black Death’, the bubonic plague which claimed the lives of some 60% of residents of affected countries. Remarkably, the rate of genetic mutation is sufficiently well understood today that it can provide a rough timetable of historical events. In this manner, a plague was dated to about 3,400 years ago, although no range of possible dates was provided. In my ‘Velikovskyan Timetable’ (See: #5. Velikovsky) which is based upon dates provided in Velikovsky’s book ‘Worlds In Collision’, two close approaches of Venus to Earth are given as 1522 and 1470 B.C. The plagues of Egypt are described in ‘The Book of Exodus’ and elsewhere and are directly associated with the first of these events. It is plausible that the plague identified as occurring 3,400 years ago was connected in some way to Venus. The close approaches of Venus to Earth given above are equivalent to 3540 and 3488 years ago (from 2018). If there is a connection, it seems unlikely it would have resulted from the introduction of new bacteria to Earth, since Egyptians would have been affected as well, and their written records don’t reflect this. One thing described in Exodus is a proliferation of vermin, and this could have had a bearing on the plague described by the Heart Institute. Plagues that affected the Egyptians are described in detail in ‘The Book of Exodus’, and the timing of the reported European plague suggests a possible connection. Biofuels were embraced by the Obama administration as a crucial part of the process to reduce carbon emissions by road vehicles, which are deemed to be a major factor responsible for their ‘anthropogenic’ climate change claims. Ethanol is manufactured by fermenting and distilling corn or sugar cane, which requires large amounts of energy. Vegetable oil, which is added to diesel fuel, comes almost exclusively from palm trees. The biofuel industry proclaims “zero net emissions” for their product, based on the premise that “fossil fuel” (oil) was formed from plants which took in carbon to grow, and this is equivalent to the carbon released when burned. This is ironic from my perspective, as in Chapter 19: ‘Catastrophic Minerals’, I explain the origin of crude oil. I posit that largely marine plant material, which is supposed to constitute the source of oil is, after being changed by heat and pressure to a mineraloid called kerogen, merely the catalyst for changing methane into oil. Carbon produced by burning biofuels is not “zero net emissions” after all. Driven once again by alarmists and self-styled environmental activists, and appropriated by politicians commonly lacking a scientific background, the entire biofuel debacle is one of the definitive examples of unintended consequences of our time. Firstly, there is no reduction in overall carbon emissions achieved by adding methanol to gasoline, and even if there were, the timeline involved would make it irrelevant. Secondly, the cruel consequences of massive environmental degradation and increased starvation among the world’s poorest is a shameful legacy for any government to leave. The major part of global corn imports by needy nations used to come from an excess corn crop produced in America, but most of this has now been redirected to the production of government-subsidized ethanol. The price of corn has risen as a result, and so the amount of production has increased. Corn responds well to fertilizer, and nutrient-rich runoff from corn fields in the American mid-west is resulting in oxygen-starved water courses all the way to the Gulf of Mexico. In Brazil, the Amazon Rain Forest is being clear-cut to plant sugar cane solely for the production of ethanol, but Brazil has been acclaimed by oil company-hating activists as a shining example to the world for running its cars largely on ethanol. The situation in south-east Asia is just as tragic, for dense rain forest covering the island of Borneo, shared by Indonesia and Malaysia, is being burned to make way for huge palm-tree plantations. Along the way, unique species which include the clouded leopard, proboscis monkey, Bornean rhinoceros and the orangutan – one of the animals closest to us – are being threatened with extinction in the wild. Vote-seeking political actions thought not to have any impact on the rest of the world can have widespread tragic results. It is wrong to destroy rainforests for the production of crops for the explicit purpose of reducing the use of oil. I acknowledge an article which appeared 2016-08-19, in the editorial section of ‘Times Colonist’ of Victoria, B.C. by Gwyn Morgan, a retired Canadian business leader who provided a valuable viewpoint on this topic. The opinions of people with such insight are frequently disregarded by politicians who recognize there may be more votes gained by following the whims of radical activists caught up by the latest fad. Environmental issues constitute an area fraught with unintended consequences, and in the case of biofuels, the results are proving tragic. The probability of unintended consequences seems not to bother those activists who are determined to save us from ourselves. One example is the generation of electricity by sources deemed to be less invasive than hydroelectric, especially wind and solar. Despite claims of lower cost and less environmental impact if we will only pay the temporary subsidies required to make these sources competitive, the costs always seem to rise. The subsidies are becoming unsustainable in many situations. Always presented as making renewable energy sources competitive, the costs just keep going up. Those discounting major disruptions to our society because they want to be more ‘green’ never seem to get the message. Just as proponents of controlled nuclear fusion continue to justify any expenditure that will carry them to their fantasy of “free” power, so are the proponents of wind and solar prepared for our electricity rates to skyrocket in the interest of “green” power. Wind and solar are proving to be less dependable, more expensive and less environmentally friendly than has been forecast. Not only are wind installations unsightly, any close to human habitation can be unhealthy due to constant noise and the incessantly moving daytime shadows. The loss of birds and bats to windmills is significant, and significance of the loss of bats, in particular, is barely recognized. Bats are more important to the ecosystem than is widely acknowledged. Several European countries, in particular, have become weary of keeping up the struggle while their electricity rates continued to increase, and investment in alternative energy is being drastically reduced. Some European countries have fewer acceptable options than Canada has with its readily available hydroelectric potential. The requirement of electrical power to our modern society is a matter of huge significance, with additional needs anticipated as more electric vehicles come onto our roads. Any proposed radical change in direction must receive careful consideration when the only reason for making a change is to be, or at least to appear to be, more “green”. We all have to accept a shared obligation to treat our environment with respect, which involves a commitment to look before we leap. In 2009, Australian scientist Dr. John Happs sent an open letter to his government’s chief scientist who had stated on the Australian Broadcasting Corporation: “The evidence is clear the planet is warming due to human activity…” Dr. Happs’ letter draws attention to a major scandal in science. It examines the activities of the ‘Intergovernmental Panel on Climate Change’ (IPCC), set up by the United Nations under the following charter: ‘To assess the scientific, technical and socio-economic information relevant for the understanding of the risk of human-induced climate change.’ Note that it wasn’t set up to determine the cause of climate change. It was casually assumed that the cause was self-evident, and no attempt was made to pretend that any other cause was worth considering. In fact, evidence conflicting with the UN’s version has been unconscionably suppressed and denied. Many scientists have signed petitions against the IPCC’s political and ideological findings but all were ignored, just as reviewers were ignored when critical of any IPCC policy. The often quoted phrase of ‘thousands of scientists’ who support the IPCC is a myth, and Dr. Happs’ letter reveals that a tightly knit bunch of 53 authors and about 5 reviewers are the only ones who explicitly defend the IPCC’s claims. It is astonishing how successful the IPCC has been in promoting its claims to gullible world politicians, and the public, while ignoring its critics and exaggerating its support. Data has been cynically manipulated, and in other cases deliberately withheld to prevent other scientists from evaluating IPCC statements. E-mails provided by concerned whistleblowers in 2009 provided evidence of pressure on editors of journals who were not supportive of the IPCC, and this became widely known as ‘Climategate’. It’s like a rerun of the criminality of some astronomers who brought about the ‘Velikovsky Affair’ in the 1950’s. This colossal scam has been going on for years, resulting in a brake on the economies of entire countries. We need to reduce pollution, but clean CO2 is not a pollutant. Plants breathe in CO2 and breathe out O2, while we do the opposite. CO2 makes trees grow, and one emphasis should be toward making CO2 emissions cleaner. I attended a presentation by Dr. Michael Mann at the University of Victoria. 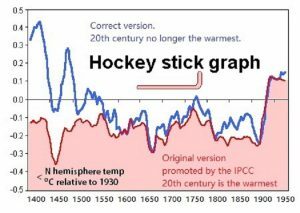 Dr. Mann is Director of the Earth System Science Center at Pennsylvania State University, and is best known for his ‘hockey stick graph’. This graph purports to demonstrate that the past century has been the warmest in 600 years, and the IPCC included it in a 2001 report claiming the 1990’s was the warmest decade, and 1998 the warmest year, of the millennium. 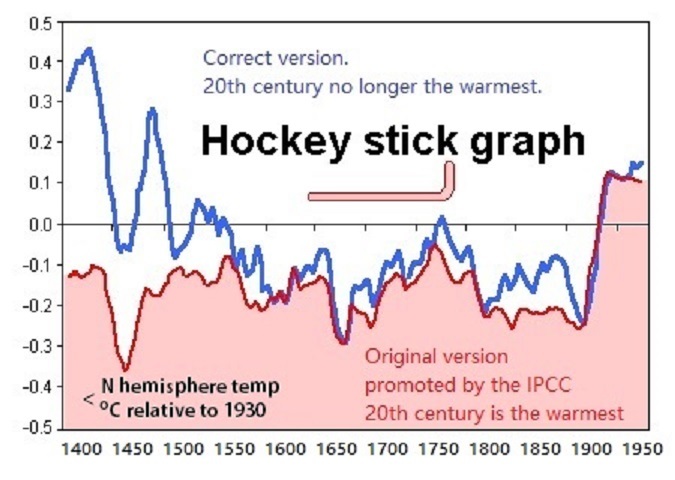 Unfortunately, data on which the graph was created deliberately started right after the well-known ‘Medieval Warm Period’ (900 – 1300) when the world was warmer than it is today. Dr. Mann defended his graph to questions from the audience, even though the IPCC had quietly dropped its support for it, explaining that the medieval warming was not global, but only local. No evidence has been provided that would support this claim. Recently, Australia made a significant step forward by cancelling its carbon tax, while countries like Canada are still firmly headed in the opposite direction. Many of our politicians seem to have adopted the mindset that defending anthropogenic global warming is a practically guaranteed vote-getter, in spite of evidence against it. Universities and scientific institutions are joining the act, where the probability of grant applications succeeding if they include ‘climate change’ is becoming an increasing scandal. Impressionable children are being brainwashed with emotional propaganda in school. One reference on the topic is available at www.undeceivingourselves.org under the heading ‘IPCC’s abuse of science’. 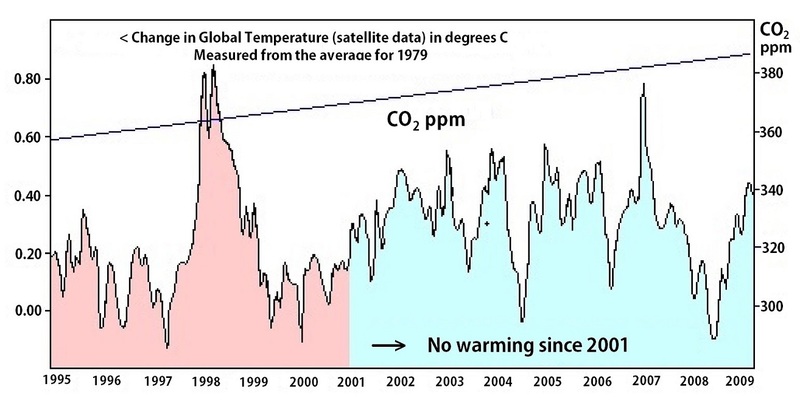 The above images ‘Hockey stick’ and ‘Warming chart’ were reproduced from this site. 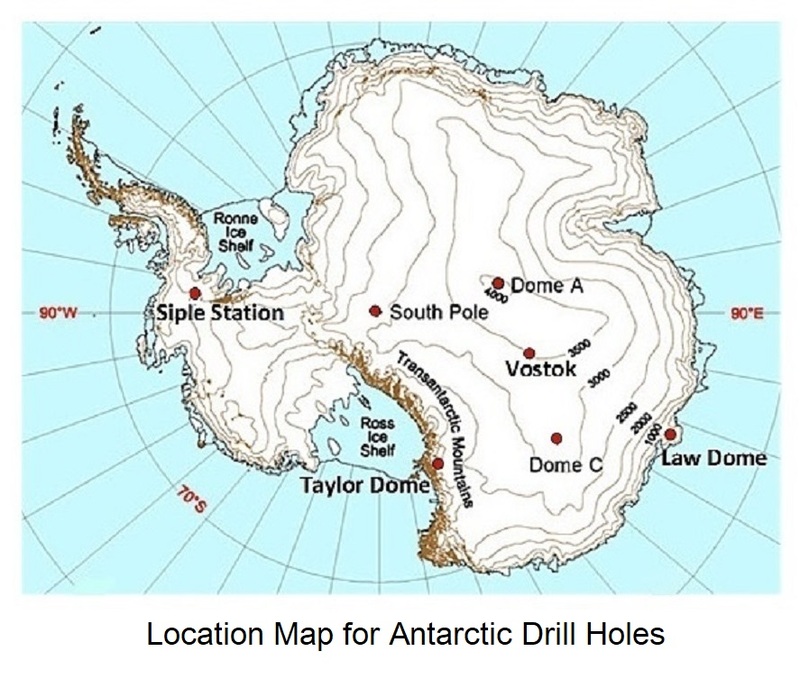 This thought-provoking paleo-climate record based on ice cores from the Vostok drill hole in East Antarctica is the result of dedicated efforts by Russian, French, American and British workers. This deep drill hole represents a considerable investment over many years, with the work carried out under conditions that were extremely challenging. The cyclic nature of the trends is remarkable, with the graph suggesting we could be on the cusp of a much colder climate that will persist for thousands of years. The graph is presented on a small scale so that the width of the most recent peak represents less than the past 11,000 years. Before this, there is no recorded human history! All past civilizations of which we have much knowledge, such as Grecian and Roman, developed within the latter part of this time interval. So did civilizations which remained unknown to us until recently, in the jungles of south-east Asia and Central America. And so did civilizations known to us by only a few artifacts, as in Nigeria, where finely detailed bronze castings produced by the sophisticated ‘lost-wax’ method are the only evidence ever found of a mysterious civilization. Most agriculture and animal husbandry, and manufacturing including the making of paper and cloth, and metallurgy and chemistry, and electricity and electronics, and modern medicine and construction and transportation have all been developed within this single astonishingly productive warm period. Before then, people struggled to survive and died young. Of the twenty or so hominid species to have been identified so far, several are believed to have co-existed until a few tens of thousands of years ago before going extinct. An increase in the rate of catastrophism, resulting from oceanic floods caused by axis changes, together with the extreme cold of an ice age, could have been contributing reasons. People have always tended to favor coastal homes, where food may be more abundant but where there is no defense against oceanic floods. Throughout the period including the ‘Medieval Warm Period’ (900-1300), followed by the ‘Little Ice Age’ (1300-1870), which included all of the ‘Maunder Minimum’ (1645-1715), average temperatures overall are thought to have differed from today by less than 2o C! This can be compared to a change of 6o C that the graph implies lies ahead for our descendants. It could come soon enough to directly affect us, or our children. If this long-term pattern continues it will alter established agricultural practices over all the world, and starvation will result in the deaths of billions of people, as well as other species. We have grown accustomed to mild temperatures and regard the situation we have grown up with as our entitlement. The Vostok core suggests a frighteningly different story. Almost no sunspots were recorded throughout the Maunder Minimum (1645 to 1715), and recently the incidence of sunspots has dropped markedly. This could indicate the start of rapid change. At a time when climate alarmists are obsessing over a possible increase of 2oC, none are concerned about a much greater threat that could lie ahead. Given the ice core source of the data, there is some uncertainty about the precision of the timing and it is not possible to predict how many years, if any, it might be before we find ourselves on the next steep downward curve. One thing the graph suggests, however, is that this curve foretells Earth’s future. Several axis changes took place during the period represented by the Vostok core, which may be reflected in peaks of atmospheric dust content in the ice. Remarkably, they resulted in no noticeable change in the prominent repetitive pattern displayed by the graph. 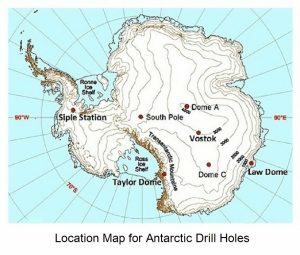 This indicates that East Antarctica remained within the Antarctic Circle during the lengthy period represented by the ice core. The International Panel on Climate Change (IPCC) has managed to convince many that we have to stop putting CO2 into the atmosphere or else it will soon be “all over” for us. (That would be the same United Nations that has put Saudi Arabia on their Human Rights Council and Iran on their Commission on the Status of Women.) One underlying reason for the IPCC position may be driven by a desire by poorer countries to share the wealth of richer ones through the UN acquiring taxation entitlements. Some individuals involved have become wealthy by promoting the UN’s agenda. In a constant state of paralysis dictating inaction, the UN is the ultimate example of big government lacking accountability. It is a fact that if the United Nations did not exist, we would have to invent it, for hostile regimes must have a setting in which to communicate, but that does not justify us getting ensnared in every aberrant scheme the UN chooses to promote. Reducing pollution is a good thing, and if we could reduce the distribution of chemicals from industrial activities and plastics dumped into the oceans, that would be a very good thing. But it should also be recognized that significant amounts of dangerous chemicals are being deliberately added to our atmosphere by activists in government-sanctioned experiments, intended to determine how to control the weather. Aviation is a prime contributor to cloud formation in the upper atmosphere, which can affect surface temperatures, but there is little chance of air travel being controlled. Now space tourism is being promoted. We must stop obsessing about CO2, which enables plants to grow better, and recognize that the term ‘pollution’ has been given a new definition. Some CO2 from the atmosphere ends up in the ocean, and if some shellfish are unable to form shells, which are obviously critical to their survival, this may be an example of a cyclical driving force of evolution. Extinction patterns of some Mollusks and Protozoa may have tracked long-term climate patterns. I have wondered whether repeated climate changes in the past have induced a genetic flexibility into these creatures that indirectly shows itself in rapidly changing shell design, much of which is unclear as to its functionality. Coral throughout the tropics is being bleached white by warmer water as polyps expel algae that live within them. This does not signify instant death for the coral, but if water temperatures remain high during the following winter and beyond, polyps will eventually starve, as they depend upon the algae for their food. We can make our greatest contribution to the planet by limiting our demands upon the environment in general and by ‘treading’ as softly as possible over land, sea, air and in space. Our record in every case has been abysmal. Carbonic acid forms when CO2 dissolves in rainwater, which is neutralized by coming into contact with alkaline rocks. The carbon is carried as a bicarbonate ion in rivers pouring off the land, and this works to combat acidification of the oceans. At the same time, the oceans absorb CO2 directly from the atmosphere, an effect which decreases as concentrations of CO2 in the oceans increases. The degree of acidity is based on the activity of hydrogen ions and is measured along a negative logarithmic pH scale. A pH of 6 is 10 times more acidic than a pH of 7, which is neutral. We cannot control our climate, but when the temperature rises by 1 or 2o C we think we have to do something about it. What we need to do something about is human overpopulation, pollution, and the destruction of habitat of our fellow space travelers. The solutions are seen as too difficult, or are being rejected because they appear to be ‘politically incorrect’. When Earth begins to slide into the next ice age, which will continue for thousands of years, you can be sure that there will be as many interventionists determined to take radical measures to increase the temperature as there are those who are now determined to decrease it. If the chill comes soon enough it could be some of the very same people. Lower temperatures and lower sea levels as the Polar ice caps build up are not the sort of problems most climate change alarmists have in mind these days. Modern technological achievements have led us to an unwarranted sense of our pre-eminence in natural matters. Extensive regions in the far-North, and elsewhere, are going to become uninhabitable, even to the Inuit. To make us less vulnerable it would be necessary to reduce our numbers and develop procedures for adapting to the approaching ice age, including the production of much of our food under cover. The concept of escaping to Mars is sheer fantasy promoted by a few people who like to consider themselves progressive thinkers. Supporting even a tiny colony there would require a commitment that no declining economy could support. It is plausible that the problem of missing ice layers increases with increasing age, and this raises an intriguing possibility. Perhaps the peaks in the ‘Doomsday Graph’ should really be equally spaced apart. This would reflect a fundamental cycle affecting the Sun, and even our entire Galaxy. An oceanic flood passing over an icecap could easily remove ice deposited during the previous thousands of years. There is no present proof of this, but consider that even the trends in the graph turned up unexpectedly. Our present social system is dependent upon constant growth for its continuation, leading to the well-known observation that if you think this can continue indefinitely you are either insane or an economist. Half the wealth of the entire world is owned by a handful of individuals. The threat of human overpopulation intensifies while powerful institutions promote philosophies that are totally out of balance with the ecosystems of our planet. A tragic example is the Philippines, where a major export is people, and where large families survive as modern hunters and gatherers on garbage dumps. A doctor who was teaching nurse-practitioners to carry out vasectomies in poorer districts was forced out of the country by the Roman Catholic Church. The belief systems of some of our most influential organizations, in government, the United Nations, and religion are moving in the wrong direction, with policies that threaten the future of civilization. We are devastating the biosphere of this planet, and when we finally recognize the seriousness of our situation it could be too late for our present culture to continue. But it won’t be because we added too much carbon dioxide to the atmosphere.